This page addresses point #6 of "My Burden is Light" You may go back to point #5 here. If you haven't, please read the introduction to this series examining a question about the time of the start of the Sabbath. Point #6 of the study "My Burden is Light" is reproduced below (with only some minor formatting changes) in the shaded portion. The examination and commentary of it follows. If you haven't done so, please read the introduction to this series examining a question about the time of the start of the Sabbath. Point #6 of the study "My Burden is Light" is reproduced (with only some minor formatting changes) in the shaded portion below. The examination and commentary of it follows. "And the flesh of the sacrifice of his peace offerings for thanksgiving shall be eaten the same day that it is offered; he shall not leave any of it until the morning" [H1242]. If the following morning [H1242] was the same day as when the sacrifices were offered, why could none of the offerings be left till the morning [H1242]? These statements (such as Lev 7:15) suggest that the morning [H1242] marks the beginning of a new day. Interestingly, the word "morning [H1242]" is translated from the Hebrew word "boqer" (Strong's H1242) and could be rendered as "morrow"! Did you notice that Aaron woke up on the morrow [H4283, the next day], which was early in the morning! Does this not yet again clearly indicate that the morning is the beginning of a new day? Assuming the sacrifice was made during daylight hours, the next morning would not be the same day as when the sacrifice was made in either case. The day could start at either sunset or sunrise and the instruction would remain the same. If the sacrifice was made in the evening (which I would say is unlikely, but have not seen anything that says it could or couldn't be offered then) then it would have to be eaten and/or any remains disposed of by the morning. In that case, the offering of the sacrifice and the eating/disposal of it is all happening within the evening and therefore both events are obviously happening on the same day. When the day starts is not an issue because in either case everything has to be gone by morning. There is no evidence in this verse that the calendar day starts at sunrise. Assuming Aaron made the proclamation before sunrise, we have exactly the same situation as in the verse just discussed above. 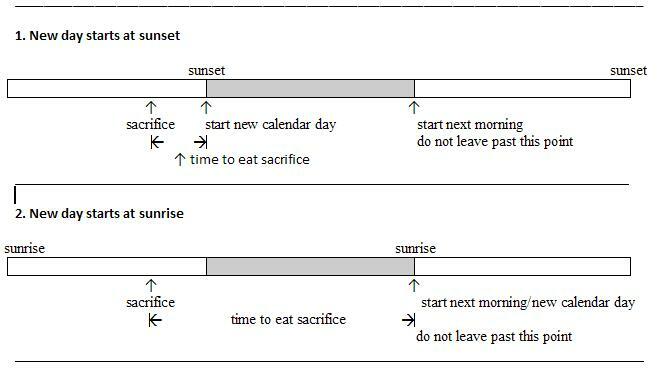 In either case, there is a change to a new calendar day (either at sunset or at sunrise) before the next morning when they offered the sacrifices. Events happening in the light part of successive days occur on separate calendar days regardless of whether a day starts at sunset or sunrise. If Aaron made the proclamation after sunset we have a different situation. 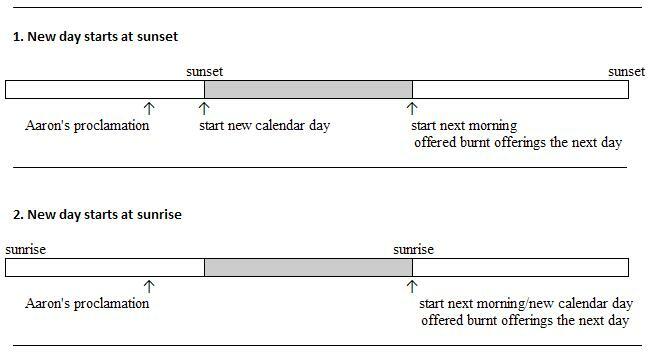 If the new calendar day starts at sunrise then the offering of burnt offerings etc happened after the start of a new day at sunrise and so it was the day following Aaron's proclamation. If the new calendar day starts at sunrise then the offering of burnt offerings etc. happened on the same calendar day that Aaron made the proclamation. That situation would appear to be a blow to the position that a new calendar day starts at sunset. 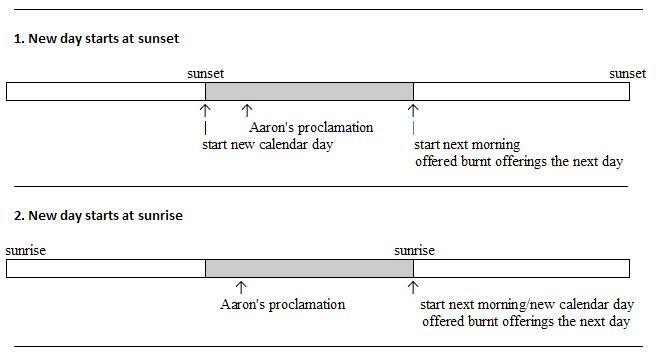 However, there is no evidence for sure of when Aaron made the proclamation - before or after sunset so there is no proof in this point that the day starts at sunrise. However, there is also an issue with the meaning of the word "morrow" that is not being considered in "My Burden is Light." That will be dealt with on the next page.